In response to the Larne gun-running in arming the Ulster Volunteers, the Howth gun running was intended to redress the balance by providing arms to the Irish Volunteers. It took place in Ireland on 26 July 1914, 98 years ago this week. An article by Aengus O Snodaigh. Republican leaders in 1913 decided that it was an opportune time to challenge England’s illegal occupation of Ireland through force of arms or threat of armed revolt. Following their establishment to the Irish Volunteers in the Rotunda Rink, Dublin, on 25 November 1913 they set about arming and equipping the new force. The order prohibiting the importation of arms was making it difficult to obtain rifles, revolvers and heavy weaponry. Seeing unionists import huge quantities of arms unhindered into Ulster, they undertook to follow suit. Darrell Figgis accompanied Erskine Childers to Hamburg in Germany where they purchased 1,500 second-hand Mauser rifles and 49,000 rounds of ammunition. In a ruse Childers let it be known that an Irish trawler was transporting the cargo to Ireland. English warships spent their time intercepting all Irish trawlers in the area while in fact it was Childers’ yacht Asgard and Conor O’Brien’s Kelpie which carried the precious cargo to Ireland, having been loaded from a tug in the North Sea. At home preparations were put in place to receive the weapons. The Volunteers organised regular route marches and parades so when the day came they wouldn’t appear out of place or alert police attention. Unknown to most Volunteers and Fianna the march scheduled for 26 July 1914 had a secondary purpose. Just prior to the arms landing the officers were appraised of what was occurring, phonelines were cut, the Fianna trek-cart was emptied of its 150 oak batons, guards were put on coastguard and police stations. 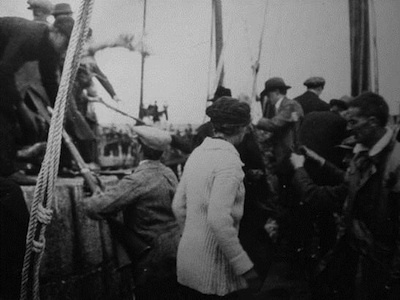 Unlike the unionists’ Larne gun-running episode the Volunteer leaders predicted that British forces would make a move against the arms landing and so only Childers’ boat was detailed to land its cargo in full view in daylight in Howth, County Dublin. Nearly half of the shipment was destined for Kilcoole, County Wicklow aboard Sir Thomas Myles’ Chotah which had relieved the Kelpie of its load. These were landed a week after the Howth landing due to a storm. “Eoin MacNeill - a prominent member of the Irish Volunteers - lived in Howth at that time and the task of collecting the arms from the yacht Chota was assigned to MacNeill to organise. MacNeill appraoched the owner of a local fishing boat - Peter McLoughlin - and requested his co-operation. Enthusiastic co-operation was assured by Peter, who owned a 35-foot fishing boat called the Nugget. This vessel was the first Howth fishing boat to be fitted with an engine. “On the night the Chota was due at a pre-arranged position outside the Kish Bank, the Nugget sailed from Howth crewed by three brothers of Peter, James who was skipper, Nicholas and William, and Michael Moore. Also on board were a number of MacNeill’s men to supervise the transfer of weapons. On the votage to the Kish Bank a stowaway was discovered. He was a young schoolboy whose name was Edward Moore. Meanwhile lying off Lambay Island outside Howth in the Asgard Childers and his companions Mary Spring Rice and Mary Osgood had awaited Darrell Figgis’ `all ready’ signal. With no sign of it and having passed through a naval review in Spithead and encountered the British warship HMS Froward Childers decided to proceed regardless. The police and coastguard attempted to interfere, but the sight of rifles made them back off. They weren’t to know that they weren’t loaded. The Volunteers and Fianna headed back into Dublin in military formation, passing armed policemen in Raheny, bypassing a military blockade against them in Clontarf. The military, Kings Own Scottish Borderers and Dublin Metropolitan Police under Assistant Commissioner Harrel rushed in front of them again. With bayonets drawn they declared the march “an illegal assembly”. Bulmer Hobson at the head of the Volunteers confronted them and said they couldn’t have the weapons they were demanding and that they would continue to march. Harrel ordered his men to disarm the Volunteers and a number charge the Volunteer ranks. A hand-to-hand fight followed and a number of shots were fired. A few Volunteers received bayonet wounds before order was restored on the pretext of a parley with Harrel. While Thomas McDonagh and Darrell Figgis remonstrated with him Hobson gave the order to disperse from the rear, and each to bring their rifle home with them. Thus the parade dissolved before Harrel realised what was happening. Public indignation at the firing on an unarmed crowd was increased by the British prime minister’s statement that he was sure that the military would be found blameless. At the massive funerals for the dead of Batchelor’s Walk the Volunteers in full military attire and armed, marched to the graveyard and a salute was fired over the graves.